Title : Chapeau de paille de riz orné de plumes.. (2508). Map maker : COSTUME PARISIEN. Size : 6.9 x 4.7 inches. / 17.5 x 12.0 cm. 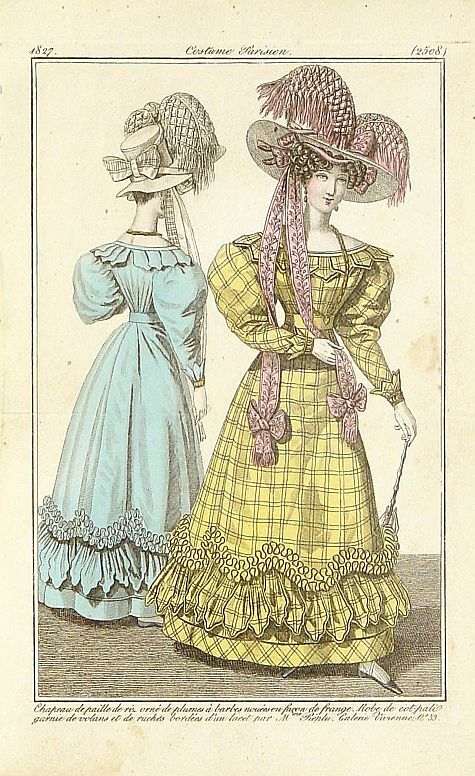 Description :From Costume Parisien (1797-1839). Paris was the capital for fashion innovation and design. After the final defeat of Napoleon, English and French fashions merged to close accord. What was in vogue in Paris would be worn by fashionable ladies in Vienna, Berlin, Rome and London. The hand-coloured French fashion engraving was responsible for filtering the new styles throughout the major cities of Europe and thus represented great wealth to the clothing industry of Paris. No expense was spared to commission talented engravers and colourists for these beautiful works of art. Condition : Very good condition. With horizontal fold.